Spanish Tortilla is one of those recipes everyone should have in their back pocket. Essentially a potato-and-onion frittata, this satisfying and simple dish is traditionally part of a tapas feast but lends itself beautifully to brunch, lunch, or dinner. 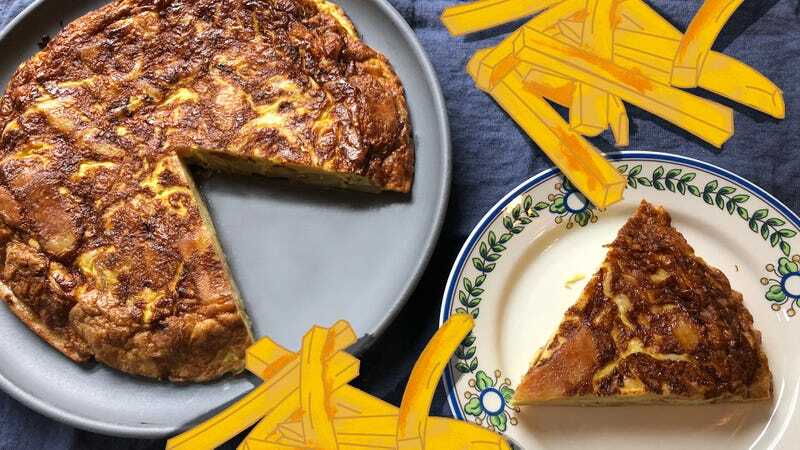 But unlike a frittata, which can be thrown together quickly (tossing leftover fridge bits and bobs into a skillet with a ton of eggs and letting them cook into a giant egg cake), the real Spanish tortilla is a tad more complicated. First off, it calls for cooking raw, fresh potatoes in an obscene amount of olive oil—many recipes call for as much as two or three cups worth (yow!). This step, while it absolutely makes the dish lush and decadent, is somewhat of a pain. Raw potatoes, simmering slowly in olive oil, can take 25 minutes to cook through before you even begin to assemble the rest of the dish, which makes it a much longer process. Then you have to carefully drain that hot oil, which unless you own a steady hand, can be dangerous for the uninitiated. And then, halfway through cooking it, there’s a very delicate procedure of inverting it onto a plate and then sliding back into the skillet to finish cooking on the other side, which for the uncoordinated is a recipe for ending up with a half-cooked tortilla on the linoleum floor. Lastly, unless you are making this dish with frequency, it can get expensive. In order to get the flavor right, you need high-quality extra virgin olive oil. You can reserve the oil for future potato frying, but you’ll have to store it in the fridge and reuse it within a short time frame. You might get two, possibly three batches out of the oil before off-flavors make it unusable. If you are on a tortilla kick or are making several for a party, that can work, but just for a once-in-a-while-dish, it is just somewhat wasteful. But the magic of the simple flavors of potato and onion and egg, enriched with that perfume of olive oil is not something you have to save for special occasions. Enter the Lazy Spanish Tortilla. By replacing the fresh fried potatoes swimming in a pool of olive oil with frozen French fries tossed in a small amount of oil and oven baked before assemblage, you speed up the process and eliminate both the danger of deep frying and the oil-waste issue. While the fries are baking you can pull the rest of the ingredients together, and the whole thing is finished in less than half the time of the traditional recipe. Since it finishes cooking in the skillet in the oven without flipping, there is no danger of a floortilla incident. This dish is great served warm or at room temperature, and while it makes for a great finger food appetizer, you can serve it wherever you would serve a frittata or quiche, as part of a brunch buffet, or alongside a salad for lunch or a light dinner. It’s delicious plain, but also can stand up to some summer sauces like a fresh herb oil or a chunky tomato sauce or spicy salsa. Preheat the oven to 450 degrees Fahrenheit. Toss the frozen steak fries in two tablespoons of the olive oil, spread in an even layer on a baking sheet, and bake until crisp-tender, 25-30 minutes, but not heavily browned. Reduce oven heat to 400 degrees. While the fries are baking, in a large (12-14 inch) nonstick oven-safe skillet over medium-high heat, heat one tablespoon of olive oil until it shimmers. Add the onion to the skillet with a sprinkle of salt and sauté until onions are softened, about 4-5 minutes. Transfer to a large bowl and add the cooked fries into the bowl and toss with the onions until well mixed. Add eggs to the potato mixture; season with salt. Using the same skillet, heat the remaining olive oil (three tablespoons) over medium-high heat until it shimmers. Add the egg and potato mixture, being sure to move the potatoes around so that they are fully submerged. Reduce heat to medium; and cook tortilla until there is a good set, it will be runny on top and loose in the middle, but should move as one unit in your pan, about 10 minutes. Slide the whole skillet into your oven and continue to bake for another 10-15 minutes until the tortilla is set all the way through. A knife inserted in the middle should come out clean with no wet egg residue. Invert onto a cutting board or serving platter. Serve warm or at room temperature, cut into wedges for a main course or squares for an appetizer. Tortilla can be made two hours ahead and can stand at room temperature. * Spanish tortilla is different from frittata in that there’s usually just enough egg present to hold the potato together, instead of being egg-forward. If you prefer an eggier dish, add an additional 3-6 eggs, and add 2-5 minutes to the cooking time. You should not need a bigger skillet.